Experience elections with GenerationNation’s Student Election! 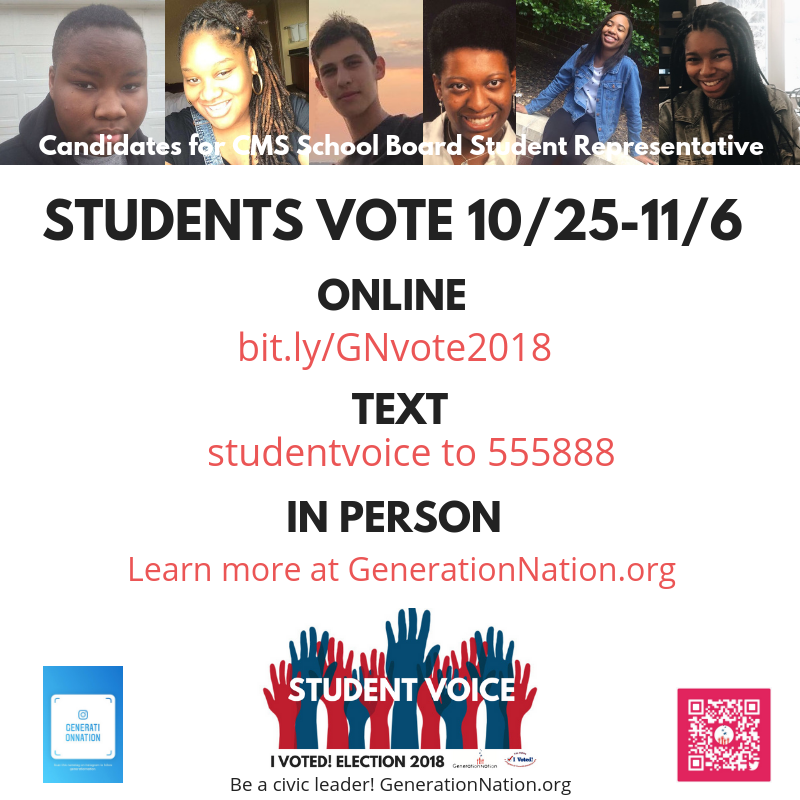 Still known to many as Kids Voting, the student election program of GenerationNation offers K-12 students opportunities to learn about and get involved in elections each year though a mock vote, service-learning in polling places, student council elections, teacher curriculum and more. Since the program was launched in Charlotte in 1992, hundreds of thousands of students have participated. Volunteer and run your own student voting booth – a great service-learning opportunity! Election results are counted and announced in the media and to schools after Election Day – you can see how students voted. GenerationNation’s programs are available to all teachers and students in any location. Contact us to learn how to involve your school or youth program in GenerationNation and the student election! The I Voted sticker is just the start! Standards-based classroom activities are available through the year for grades K-2, 3-5, 6-8 and 9-12. Use the election to drive interest and strengthen comprehension in social studies, reading, writing and math through the year! At school – ask your teacher or principal about your school’s election! Educational resources including guides, Election 2018 Jigsaw and Rate the Candidates Decision-Making Charts, and more. GenerationNation is recruiting volunteer captains to lead student voting stations during Election 2018. The mock election enables thousands of K-12 students to cast their own votes every year. To make this hands-on experience a good one for students, GenerationNation needs your help! This is a GREAT activity for students, PTAs, businesses, retirees, church groups, afterschool youth programs, civic organizations, etc. Let us host your next student council election. Contact us for more information.